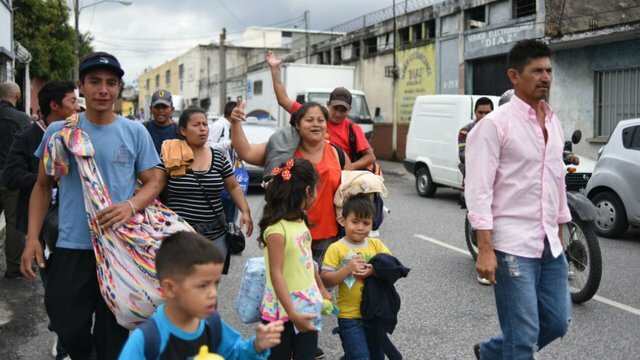 A group of roughly 1,700 Central American migrants traveling as a caravan has reached a Mexican town along the country’s border with Texas. The caravan arrived at the Mexican city of Piedras Negras, just west of Eagle Pass, Texas, The Associated Press reported Tuesday. U.S. agents in riot gear stood on the bridge separating Eagle Pass and Piedras Negras as the U.S. Department of Homeland Security (DHS) warned that no member of the “lawless caravan” would be allowed to enter the country. "Approximately 2,000 aliens have arrived in northern Mexico as part of a 'caravan' seeking to cross the border into Texas. Illegal entry will not be tolerated and we stand ready to prevent it," DHS Secretary Kirstjen Nielsen wrote in a statement. Border Patrol agents have already detained some migrants who were caught attempting to cross the border illegally overnight. The group of about 1,700 migrants arrived in the Mexican border state of Coahuila on Sunday abroad 49 buses from the cities of Saltillo and Arteaga, Gov. Miguel Ángel Riquelme told the AP. Another group is approaching the neighboring state of Nuevo Leon, a region that has been long been dominated by the Zetas cartel. The migrants have been staying at an unused maquiladora factory after traveling from Central America with military and police escorts. They have been provided with sleeping mats, blankets, food and wireless access, as well as access to public health exams. An estimated 46 unaccompanied youths between the ages of 15 and 17 were in the caravan, AP reported. Coahuila state Interior Secretary Jose María Fraustro told the AP that local officials are being “strict” about security because members of the caravan are often victims of organized crime groups who force migrants to do labor. Many migrants say they are fleeing drug-fueled violence and poverty in their native countries. Other caravan groups have chosen to pass through the border city of Tijuana, but the AP noted that the border around Eagle Pass is relatively open, marked predominately by the Rio Grande River. The border around Eagle Pass does not have long sections of fences or high barriers and is not as heavily guarded by U.S. border authorities. The Trump administration has previously sounded off against migrant caravans attempting to reach the border and enter the country. The Pentagon announced Sunday that nearly 4,000 additional U.S. troops will be deployed to the southern border to assist Customs and Border Protection in surveillance operations and placing razor wire along the border. Trump has long promised a wall along the length of the border. He demanded $5.7 billion for the structure, a figure staunchly opposed by congressional Democrats, which triggered a 35-day partial government shutdown that ended last month.